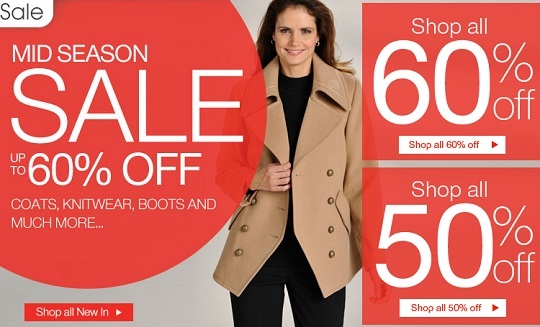 Damart is running their Mid-Season sale right now where you can get up to 60% off on coats, knitwear, boots and plenty more. You can choose between two sections – Shop all 60% off and Shop all 50% off and both are packed with fantastic deals. There are some sterling offers in there right now. You can get a gorgeous, camel-coloured asymmetric coat for £24 instead of £60 or a double-breasted jacket at £32 instead of £65. There are blouses for £15.50 instead of £39 and a stunning jersey skirt for £14 instead of £35. You will find dresses, shirts, blouses, skirts and even travel bags included in this sale. It’s a brilliant opportunity to stock up on some items for your 2014 summer wardrobe and to get warm and toasty for the winter that’s swooping in on us right now.